The Clerk and Recorder’s Office is actively involved with the State legislative process which impacts our office and you, our customers. 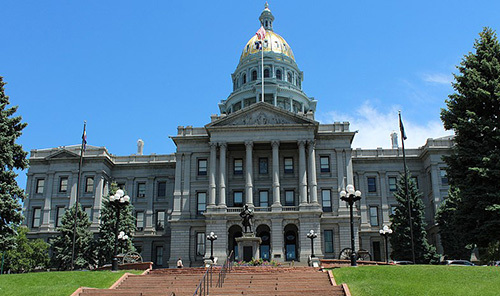 The Colorado General Assembly is in session January – May each year. During that time, bills are introduced in the House and Senate which, if enacted, become law and will govern our state and its citizens. We are committed to ensure the proposed legislation is in the best interest of the citizens of Colorado. The bills which pertain to our office are researched and tracked as they proceed through the legislative process. Visit “How a Bill Becomes Colorado Law” on the General Assembly website to learn more. Clerk and Recorder Chuck Broerman, or his representative, may testify at committee hearings for bills which would most significantly affect our state. We work diligently to provide State Legislators with the perspective and experience of this office so they are aware of all the facts before voting on a bill. In addition, there are other bills which we will track and take action on, if deemed prudent, and subject to change as the legislative session proceeds. As new bills are introduced in the House or Senate, they will be added. We strongly encourage you to read the information to learn about legislation pending before the General Assembly and to contact your State Legislators to voice your opinion. The names and contact information for El Paso County Legislators are provided for your convenience on the page Contact Your Elected Officials.